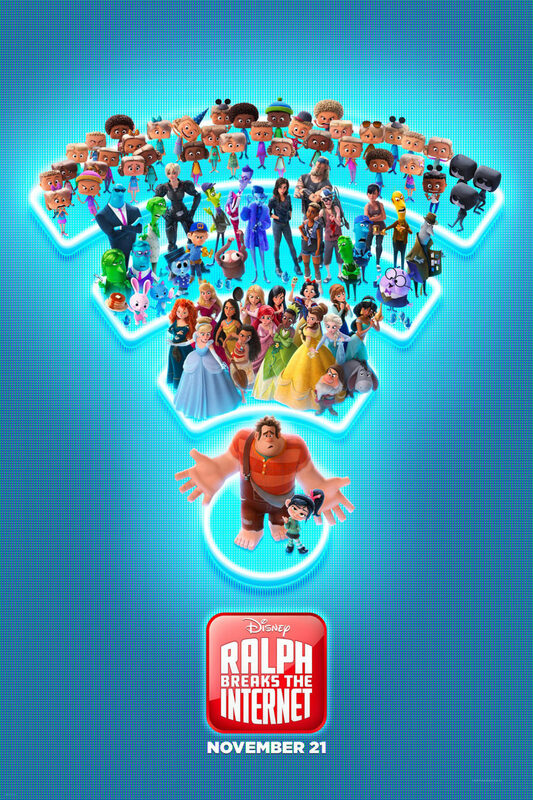 The sequel to 2012’s hit Wreck-It Ralph is a satisfying follow-up that delivers fun for the entire family. At the end of the original Wreck-It Ralph, the titular character Ralph (John C. Reilly) found himself at peace with his life as a video game villain – for he became a true hero to Vanellope von Schweetz (Sarah Silverman), a neighboring race car driver from another arcade, Sugar Rush. There is probably a lot more room to explore in the world of video game arcades, but the filmmakers didn’t go the easy route. Instead they decided to push it even further into the present, as to not wear out the nostalgia love of 8-Bit video games. 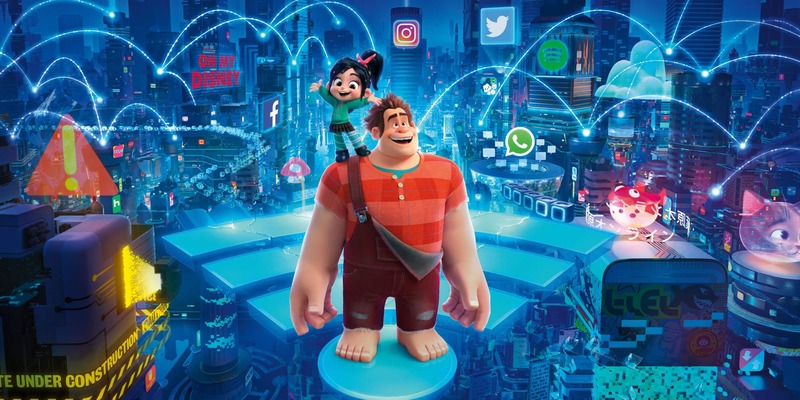 In Ralph Breaks the Internet, the pair of best friends enter the world wide web in hopes to find a missing component to save Vanellope’s arcade from being unplugged (the equivalent of unemployment and homelessness all in one). If the video game references of the first was too over-the-head for younger (or older) movie goers, the vast world of the internet might bring everyone closer together. There’s some great gags in Ralph 2 and I couldn’t help but wonder what didn’t make the cut. Directors Rich Moore and Phil Johnston keeps things light and entertaining from top to bottom, but like the best of Disney movies, you know there’s a heartwarming lesson by the end. Disney fans should be delighted in the many in-jokes layered throughout the film, but it’s probably best not to think too hard about this version of the internet world. Where Disney Princesses live together like sorority sisters at a college dorm, it’s a head scratcher on where these digital versions of Disney characters actually came from. Another video game perhaps? It’s mostly played for laughs but at least you no longer need to wonder what would happen if Princess Vanellope (yup, she’s a Disney Princess) met the rest of the gang. We even get a taste of her version of the “I Want” song, courtesy of Alan Menken, in what is a real highlight of the film. One of the few imperfections of the film is only an imperfection if you’re constantly on eBay like I am, but it ignores how internet auctions really work – mainly because it’s funnier this way. In the film, outbidding the high bidder simply requires you to say a number higher than the current bid and you’re automatically ahead. Of course that’s not how eBay works, but it’s a minor quibble since the end result is the same: How are two video game characters going to earn money to win an eBay auction to begin with? And in all honesty, we could have spent even more time in the land of eBay and the audiences probably would gobble it up. By the end, Ralph Breaks the Internet shows us the struggles, charm, and challenges of being best friends, and it really is beautiful. The initial trailers showed a movie that could have easily gone south like Emoji Movie, but Disney injects the right amount of humor and heart to deliver another winner for the holidays. Ralph may break the internet, but he’s certainly entertaining and endearing while doing it. Important note: Do make sure you stay through the credits for one of the better stingers in a Disney Animated film in forever. MPAA Rating: PG. Running time: 112 MIN. PRODUCTION: (Animation) A Walt Disney Studios Motion Pictures release of a Walt Disney Animation Studios production. Producer: Clark Spencer. 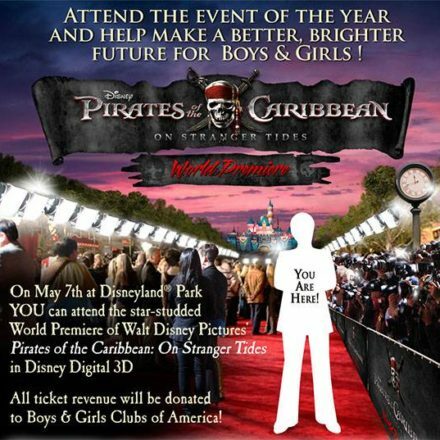 Executive producers: John Lasseter, Jennifer Lee. Co-executive producer: Chris Williams. CREW: Directors: Phil Johnston, Rich Moore. Screenplay: Johnston, Pamela Ribon; story: Moore, Johnston, Jim Reardon, Ribon, Josie Trinidad. Camera (color, widescreen): Nathan Warner. Editor: Jeremy Milton. Music: Henry Jackman. WITH: John C. Reilly, Sarah Silverman, Gal Gadot, Taraji P. Henson, Jack McBrayer, Jane Lynch, Alan Tudyk, Alfred Molina, Ed O’Neill, Sean Giambrone, Flula Borg.